Too many email marketing automation tools get in your way. ConvertKit’s automations tool is simple, but powerful. With our visual automation builder, you can send well-timed, targeted content to the humans in your audience so you can stay focused on what matters most: growing your online business. You’ll always know exactly what’s happening in your funnels with a quick look at your visual automation. All the important information for each step is right there. Each card shows exactly how many of your subscribers have completed each step. This helps you know how your content is performing and how your subscribers are interacting with it. No need to open multiple tabs or risk losing your train of thought. To edit a form or sequence, just click on your workflow and open the item in the same window. It's email marketing as it should be. 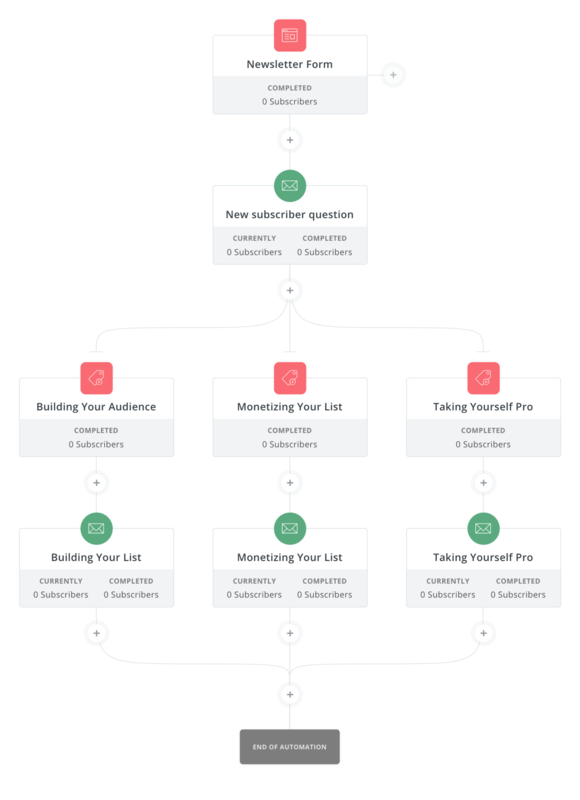 Watch your email funnels take shape right as you build them and experience your sequences the same way your subscriber does. Each step you create for your subscriber is as easy as clicking the plus button and selecting an event, action, or condition that autopopulates your next step to lead them to your desired outcome. If you’re not looking to create a whole funnel, you can still create individual automation rules with a simple “if this, then that” functionality. We focus on doing the one thing we do best– email marketing. For everything else we work with the best partners to create integrations that help you continue carrying out your email marketing automations. Did you know you can automatically create a broadcast to deliver your blog posts to your audience? You can set it up to send every time a new post is published or you can send a digest that rounds up content on a weekly or monthly basis. That’s one less thing on your to-do list. Choose what days and times to schedule a digest so your emails reach your audience right when they expect them. It’s easy to make sure the right group receives your content regularly by filtering with tags, segments, date subscribed, or even by first their name. You can send your broadcasts to everyone or you can get very specific. Let ConvertKit take the guesswork out of automations to help you build funnels for your audience. If you’re not sure how you can practically put automations to work for your business, check out these examples. No matter what industry you are in, there is always an email automation that can serve you and your audience. Automating your sales process as a freelancer takes the bulk of the leg work out of pitching. By setting up your subscriber’s journey to take them through educational content about your service, you’re establishing the answers to their big questions before you pitch your service. Subscriber opts into a form off of a blog post that relates to a service you offer and are subscribed to a sequence teaching them how to do it themselves. As they learn how hard it is to do what you do as a service-provider, some subscribers will click on a link trigger that subscribers then to a new email sequence educating them about whether they should hire a freelancer like you. If they hire you, they’re tagged in your ConvertKit account and then sent a customer onboarding sequence. If they don’t hire you, you pitch them on your entry level product so they can do the work themselves with you as their teacher. If they don’t buy a product or hire you to provide services, send them to your RSS feed related to the topic they subscribed to in the beginning, which makes their experience both personal and relevant. The best way to launch a new product is to get it out in front of your audience and start talking about the benefits they’lll receive if they purchase. Email sequences help you continue to deliver valuable content while using automation Events to keep everything on track with your launch date. These automations can also help you send targeted content to subscribers who might be interested in your product, but don’t actually purchase this time around. A subscriber is tagged as interested in your product. You can set an Event: Date Occurs for the beginning of your launch that triggers all tagged subscribers into an email sequence getting subscribers warmed up with an exciting pre-launch sequence. Then, on launch day, use another Event: Date Occurs to pull subscribers into your launch sequence right on time and get them buying your product. 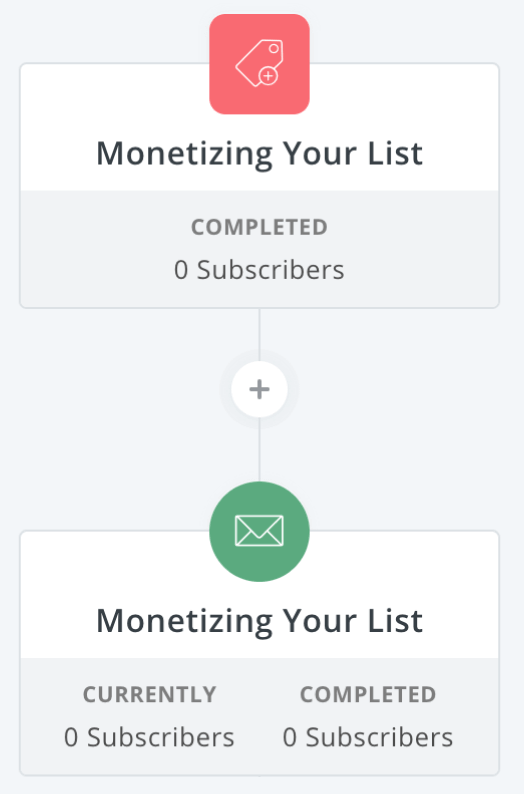 Once your product launch has ended, you can create a tag for subscribers who have purchased your product that subscribes them to a customer onboarding sequence. If they didn’t purchase your product, you can send them to a product downsell sequence that might offer a last chance to purchase at a discount or offers a less expensive product instead. Hosting a webinar is a great way to get in front of your audience to gain their trust, show your authority, and sell your product or service. By setting up automations for your webinar, you can find out more about your audience’s needs before you teach them, give yourself more time for dedicated work on your webinar content, and follow up with your new audience after you’ve hooked them. Subscriber opts into your webinar form in your sidebar or on a landing page and are subscribed to an email sequence about what they can expect to learn. You can then set up an Event: Date Occurs to trigger a sequence of reminders to make sure your subscribers remember to hop on the live event. After your webinar is over, a follow up email can include a limited time discount to purchase the product you discussed in the webinar. You can also follow up with non-attendees to download the recording (and then make a similar pitch). For any subscriber who purchased your product, you can tag them as a buyer. That tag can subscribe them to a customer onboarding sequence that eventually leads to your weekly newsletter. Finding out where your audience members are in their journey is the most important step to understanding more about them and their pain points related to your topic. You can easily use automations with link triggers that connect to email sequences. When you can segment your audience with this automations, you’ll be able to send more direct and targeted content that feels personalized to each person on your list. A subscriber opts into a form in your newsletter and is subscribed to an email sequence asking a question with three different answer options, each corresponding to a different pain point. How they answer this question will determine what happens next. The subscriber clicks on the link trigger for the answer that best represents their interests, leading them to a resources page on your site (and tagging them in ConvertKit). Each link trigger is connected to an email sequence that corresponds with that interest or pain point, creating a personalized experience for your subscribers. Send a follow up sequence that pitches your entry level product to turn your subscribers into customers. The pitch feels more relevant because of their past experience with you.